For this JumpStart Toys(TM) blog we interviewed retired elementary school teacher and gifted program coordinator, Joanne Garross, and asked her to choose a kids educational toy from our inventory. 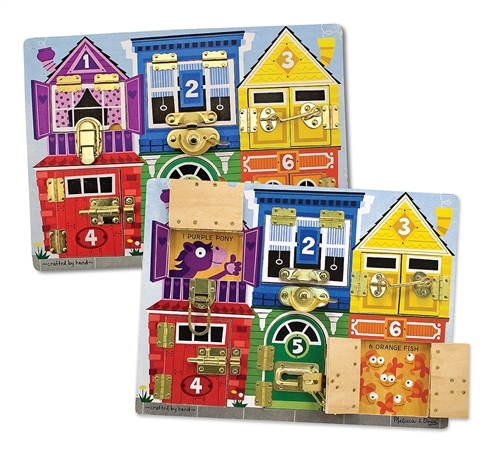 The hands down learning toy favorite - the Melissa and Doug Lock and Latches Board! Here are Mrs. Garross' answers to our questions about this terrific educational and developmental kids toy. Q: Why did you choose the Lock and Latches Board by Melissa and Doug as your "Teacher's Pick of the Month"? A: This toy has multi-dimensional learning aspects to it. As children develop, the activities associated with this toy can increase and become more complex - extending the learning value of it over time. Q: What are some of the educational benefits of this toy? Q: Can the Lock and Latches board enhance language skills? A: Yes, an adult can help children build language and vocabulary in addition to using their imagination skills to create stories about what is behind the locks and latches, how they got there and how they were rescued. Creative story-telling skills are important for kids. Size concepts, such as "biggest" and "smallest" can be taught using the size of the windows and spacial relationships, such as "top", "bottom", "side by side" and "next to", can also be taught. Q: Are there additional reasons why parents, grandparents or teachers should purchase this toy? A: It's a good interactive toy for adults and children. I really like the inclusion of parent activities on the back for easy reference. It's also made of sturdy wood and all in one piece, making cleanup a breeze and making it a good travel toy for the car. I also like that it has rounded edges instead of sharp edges at the corners. I wish I were still in my classroom to use it. JumpStart Toys(TM) Note: Additional children's learning toys that enhance cognitive, fine motor, and life skills can be found by shopping by skill on our website, www.jumpstarttoys.com. The Lock and Latches Board is a good toy, I have had for the kids and found it quite helpful to the kids.